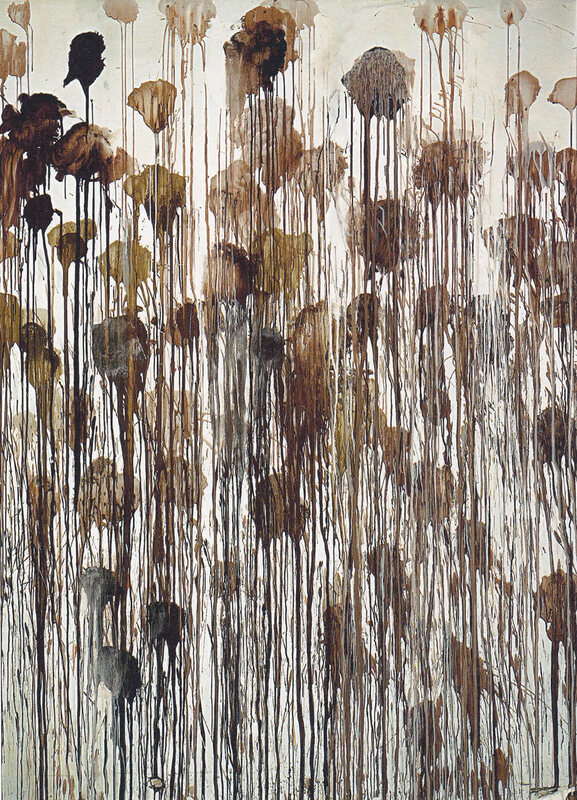 Cy Twombly was born in 1928 in Lexington, Virginia. He arrived in New York in 1950 during the explosion of the New York art scene and abstract expressionism headed by Pollock and De Kooning. As an art student in New York Twombly basically lived at the galleries on 57th street, studying, engaging with works by Klee, Gorky, Giacometti, Picasso. He never went to class because he was always at the galleries. 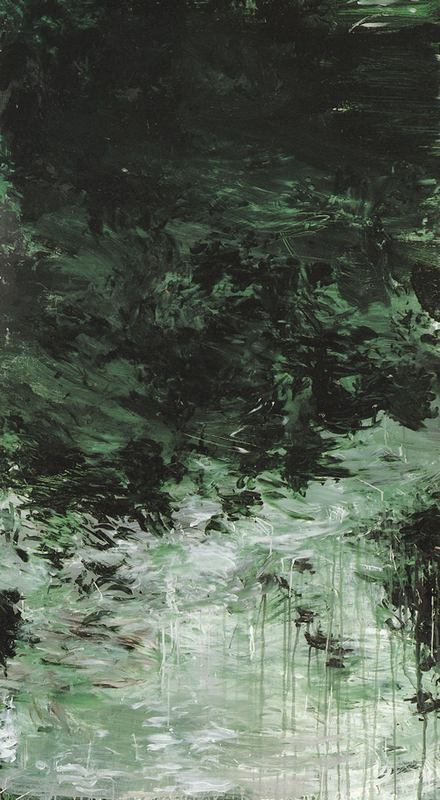 In 1951-52 Twombly joined Robert Rauschenberg at Black Mountain College in North Carolina. Black Mountain was a place of free experimentation, where painters, poets, writers and artists of all mediums were welcome to come study. Among teachers at Black Mountain were Charles Olson, Franz Kline, Robert Motherwell, and John Cage, all of who had an influence on Twombly. 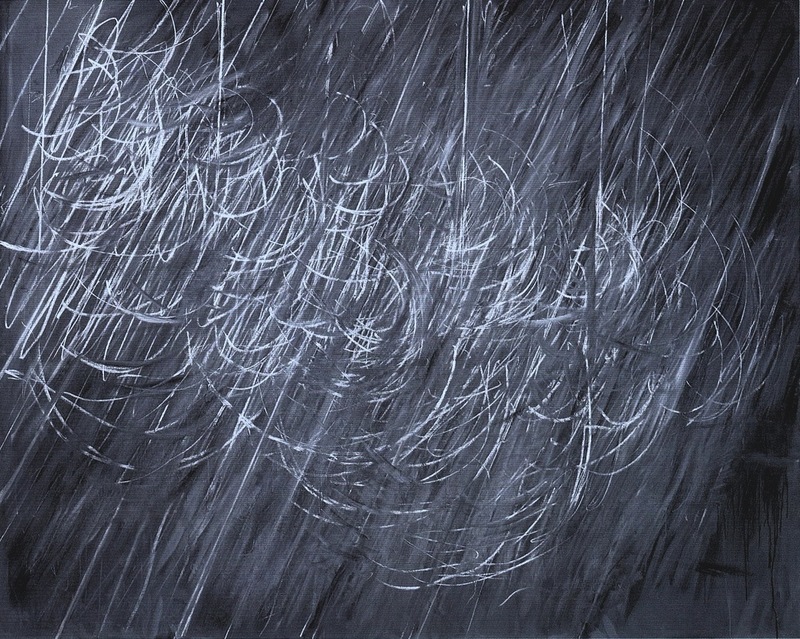 At Black Mountain one of Twombly’s main focus points became the calligraphic gesture, and the relationship between a word and an image. 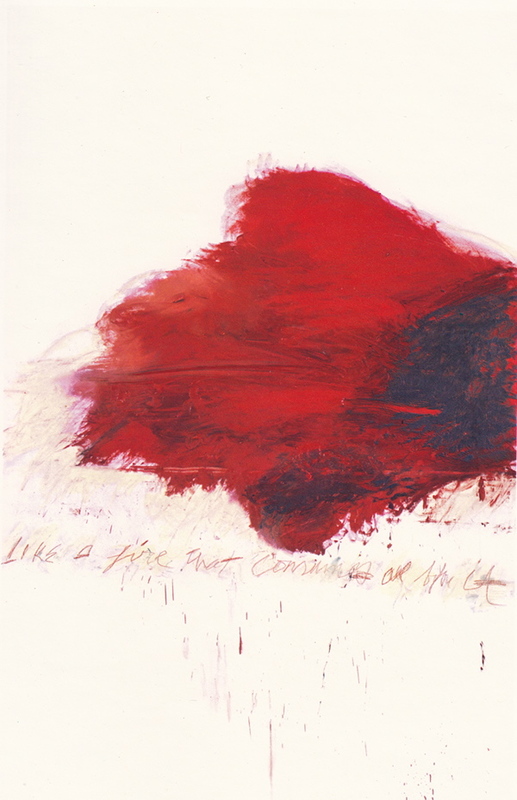 This is a theme that Twombly explored throughout his entire life as a painter. He became interested in the roots of writing in ancient cultures, exploring different glyphic forms and symbols of representation. 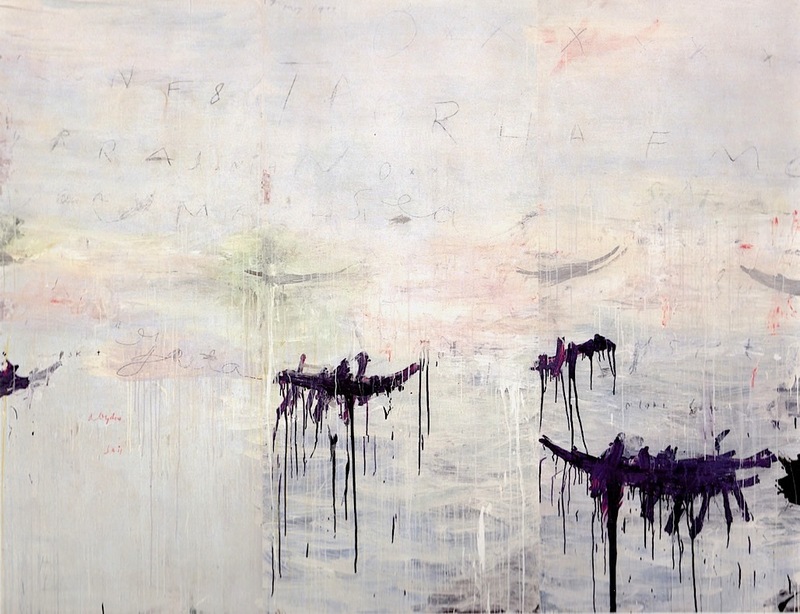 Twombly often draws on the work and verse of ancient myths and poetry, including Sappho and Homer, but he also references the forms of ancient Arabic writing, and other letter/word symbols. Before leaving Black Mountain Robert Motherwell wrote a generous testimonial to Twombly’s work, and would arrange future exhibitions for Twombly along with Sam Kootz and others. 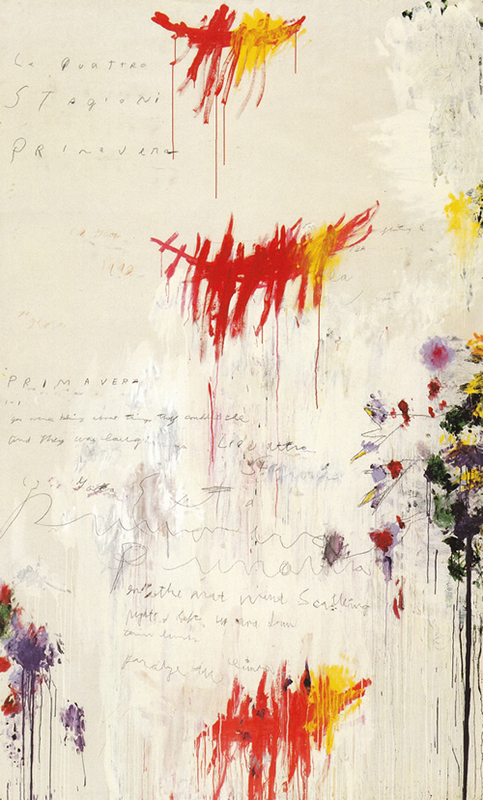 Twombly never separated painting and literature. Coming from the south, where writers are produced like a hothouse, (Faulkner, Tennessee Williams) Twombly admired the literary tradition of his home. Early in his studies in Lexington, professors would ask him, what is a painter doing in academia? 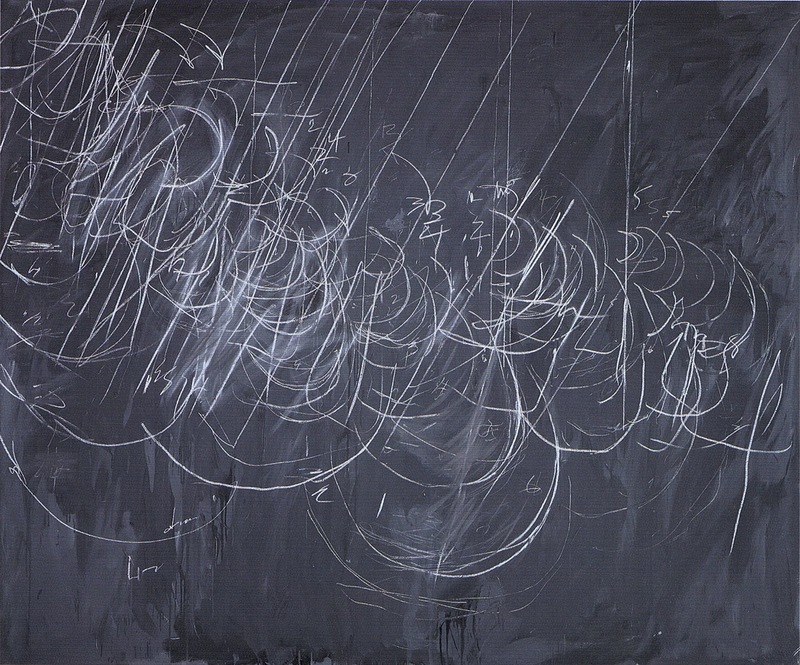 But Twombly was always referencing one to the other, painting and literature did not have to be separate. After Black Mountain Twombly spent time traveling with Rauschenberg, painting, and exhibiting. 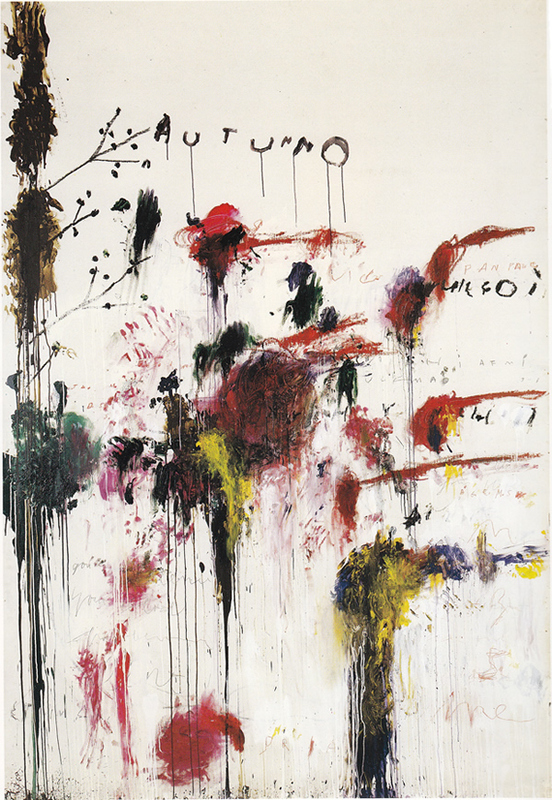 After making connections in the art scene and galleries of Italy, in 1957 Twombly moved to Italy, where he would live and work for the remainder of his life, visiting the states intermittently. 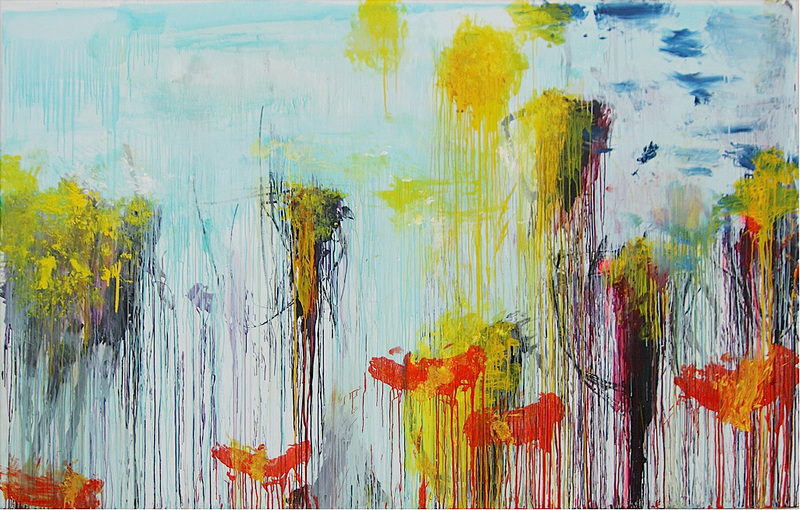 For the most part, Twombly’s work comes from a deeply poetic spirit, interested in the cycles and seasons of life. 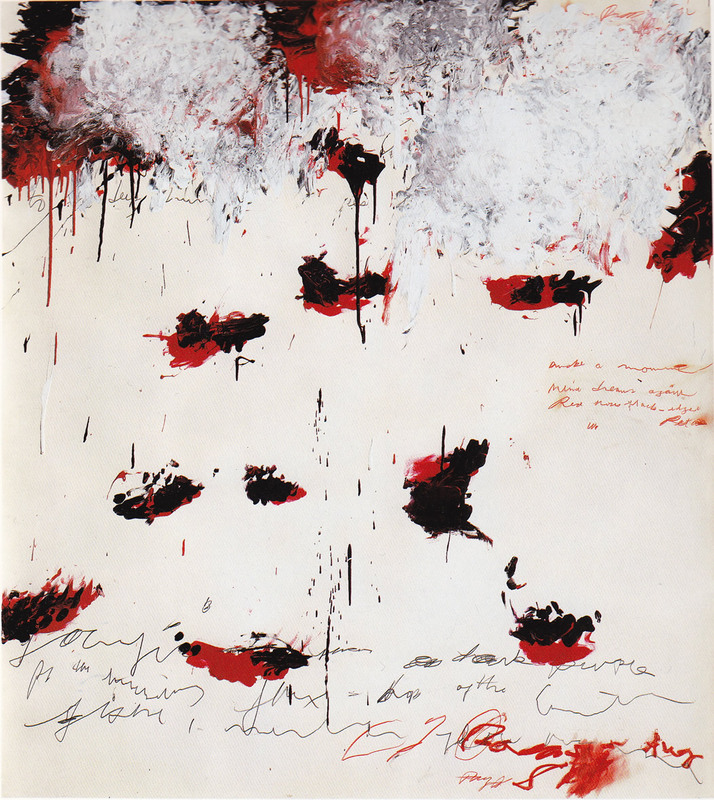 Twombly painted in cycles, and was usually working in series, he felt he could not get everything into one painting, and instead painted as though the paintings were pages in a book. He liked to paint multiple canvases at a time, each would sort of breathe life into the next, or become interconnected like a collection of poetry. He worked when he was inspired, and has said that he sometimes goes several months without painting. When he became interested in something he worked with a theme for many paintings at a time, with much energy, and generally very fast. When questioned about his process in the studio, he said that he sits for hours looking, working himself into the readiness to make a mark, and then when he has reached a particular place, he gets up and works, often very fast, sometimes with no time even for the brush, taking the paint right into his hand. Sometimes paintings would hang in the studio for years before being complete, many paintings that he began in Italy he wouldn’t finish until bringing them to Virginia years later, sometimes a change in atmosphere was helpful to him. 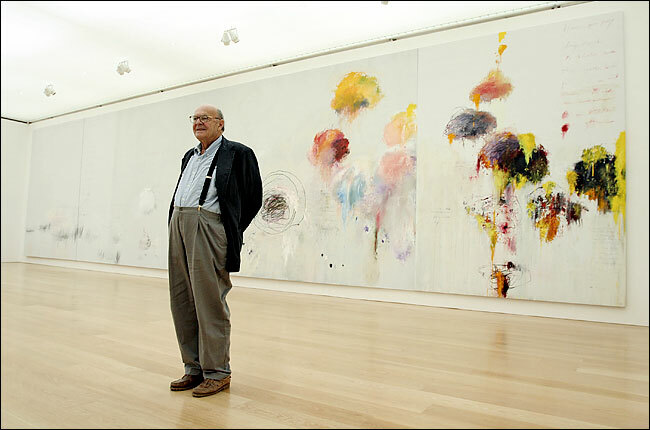 Twombly is a painter who was compelled to paint, I think he greatly enjoyed painting, and that it brought him much joy. There is a permanent installation at the Philadelphia Museum of Twombly’s interpretation of the Illiad in 10 massive panels from 1978. 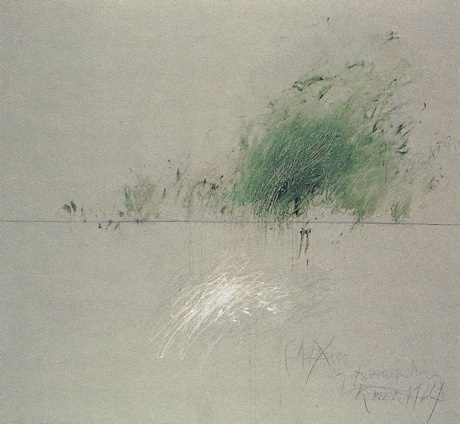 Interestingly, Twombly said in an interview that he had a difficult time with the paintings, and that although he normally likes to enjoy himself while painting, he had very little enjoyment in the creation of this particular series. The red violence of “a fire that consumes all before it” is perhaps a channeling of frustration, embodying the maniacally enraged Achilles. 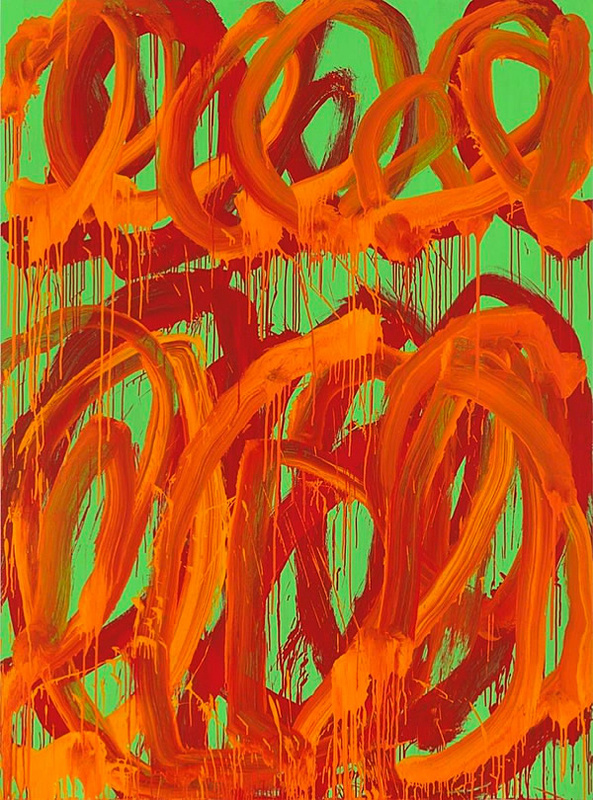 His work is intensely unique, immediately recognizable by his distinct style of making marks and writing words, along with his use of color and the way he uses paint as a medium. 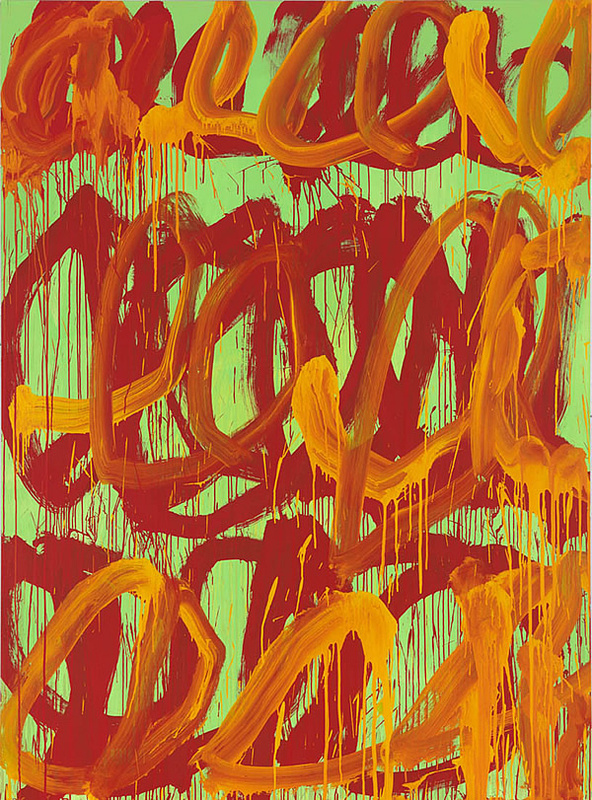 In Twombly’s work we witness the wavering between making marks and writing words, or making marks, and forming representational images. One often becomes the other, a mark will almost become a word, a scratch will become a boat, and yet still reside in another realm. I was fortunate enough to see his “Last Paintings” exhibit at the Gagosian Gallery in New York about a year ago, they were the last paintings he completed before he died in 2010. Standing before the giant swoops of yellow and red on green background, I kept almost seeing words, I was looking for words, but the swoops stood beside meaning, they were expressions of a different sort. Giving up on finding words, I began to see Tulips and flowers, but they weren’t representing them directly either. The marks were vibrating in some realm between meaning and feeling, between word and image. 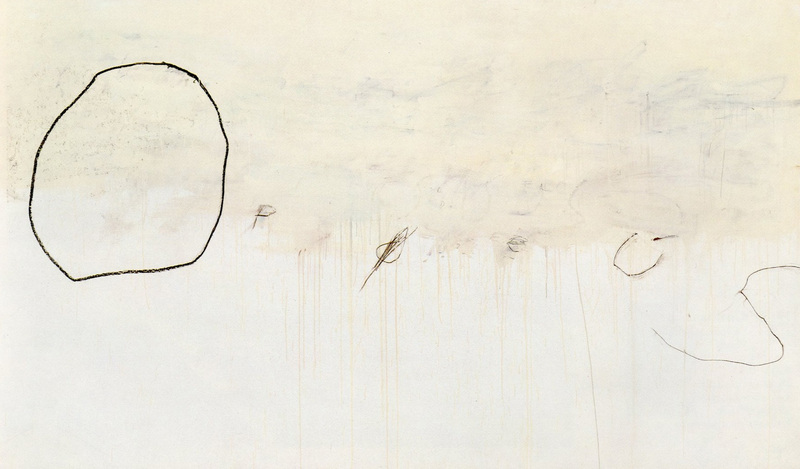 There is a magic to Twombly’s work, once one has acquired the taste for it. I have returned to him many times since we’ve become acquainted, and he has much to offer. Continues to be one of my favorite artists also. Nice to check in on you again. Hope you are painting, painting, painting. Aloha! Good to hear from you – Aloha! I am painting – thinking and painting and seeing the Sea – I hope you are painting as well – always good to hear from you! Being a poet, I love his work too. Thank you for giving more on the man and his work.